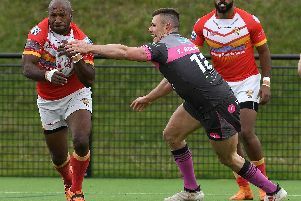 There is no talk of a top-five finish amongst the Sheffield Eagles rank and file as coach Mark Aston maintains a policy of looking at the season week-to-week. Eagles have been the surprise package of the Championship, suffering just two defeats from their opening eight league games to hold fourth position going into the Challenge Cup mini-break. Aston’s side also showed up well against top-of-the-table Toronto recently, to back up what now appears to be a strong argument for a top five finish. With many now considering the Eagles as play-off contenders, Aston has taken the strategy of keeping a lid on expectations, as he refuses to discuss the possibilities of what his side can achieve. He said: “I won't be talking about what we can achieve until we get to the end. If we get there, then I'll talk about it. I don't want to put any added pressure on us, I just want to come and enjoy it. If we can get a little bit better week-by-week, then great. I still think that there's more in us. The Eagles face a stern test again this Friday at the OLP as they host second-placed Toulouse, whilst there is a quick turnaround as Aston takes his side to Rochdale on Bank Holiday Monday. Meanwhile, veteran centre Menzie Yere came in for praise on his debut for Doncaster after he scored a try in the Dons’ defeat of Batley. Yere, on a one-month loan from the Eagles, played his first competitive game of the season, with Dons coach Richard Horne impressed with the PNG ace. Horne said: “He also has a lot of experience and scored an important try and I thought he played really well.